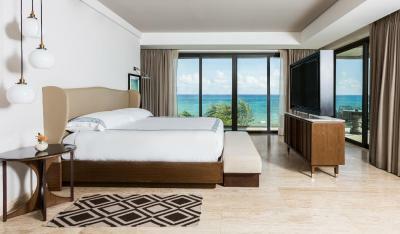 Lock in a great price for Thompson Playa del Carmen - rated 9.1 by recent guests. Staff were helpful and very polite. Rooms were very nice looking. Rooftop pool is the reason we stay. Beds are like clouds. Beautiful property. Really nice staff. Food is amazing. Showers are great. Good room service. Handy location. 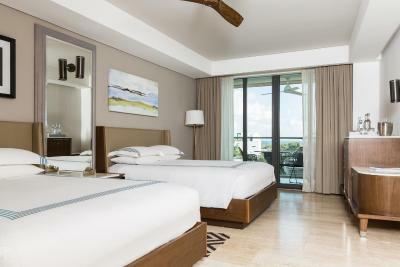 Staff are great, pool is amazing, rooms very chic and comfortable. 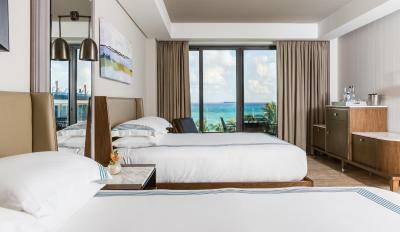 This is actually a boutique hotel with amazing facilities, staff, and top notch facilities. The rooftop swimming pool and lounge area is unique with great lounger beds, in and out of the pool, loungers immersed in the pool, swings, underwater table, etc, and it has an amazing view over the city and behind it the sea. The staff were extremely attentive, friendly and helpful. Great hotel, one the best I have stayed at. A little more expensive than it should be though. Everything about this hotel is amazing we loved the location, staff and rooms. We simply love it ! 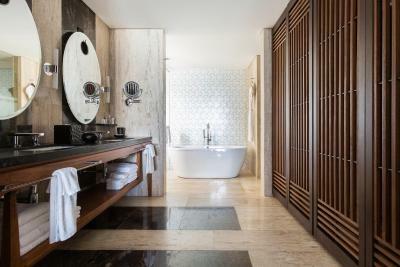 The suite with jacuzzi is just amazing. awesome food and wonderful in room service! 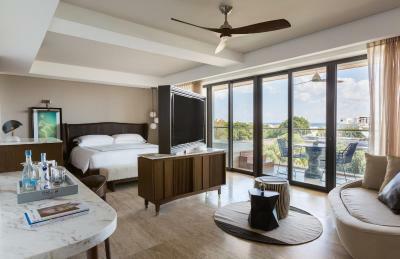 Very clean rooms and a well designed hotel (the rooms and the rooftop pool area). Good location and pleasant beach area. Most of the staff is very helpful. Bed and pillow were fabulous.pool area fantastic.The fellow at the front desk who checked us in was charming and efficient. 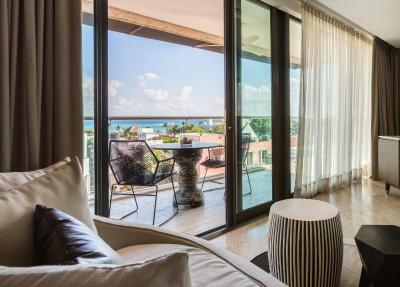 Featuring free WiFi throughout the property, Thompson Playa del Carmen is located in Playa del Carmen, 350 yards from 28 de Julio Square. The hotel has a year-round outdoor pool and fitness centre, and guests can enjoy a meal at the restaurant. Every room at this hotel is air conditioned and is equipped with a flat-screen TV with cable channels. Certain units include a seating area to relax in after a busy day. 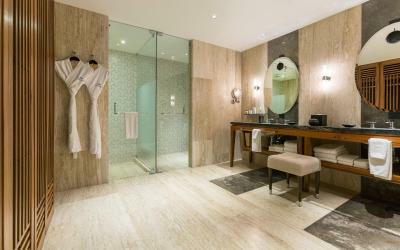 For your comfort, you will find bath robes and free toiletries. There is a gift shop at the property. You can engage in various activities, such as snorkeling and windsurfing. The hotel also offers bike hire and car hire. 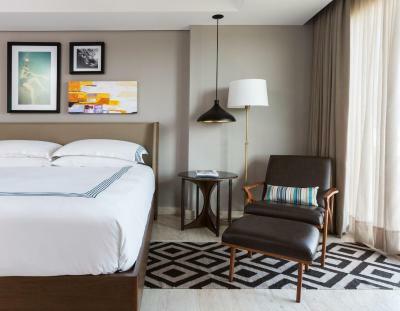 Guests will have access to Yoga rooftop classes every morning, Tequila or Mezcal tasting, daily bottled water and Mexican candies at turndown and a faster WiFi connection. ADO International Bus Station is 750 yards from Thompson Playa del Carmen, while Playa del Carmen Maritime Terminal is 1,000 yards away. The nearest airport is Cancun International Airport. 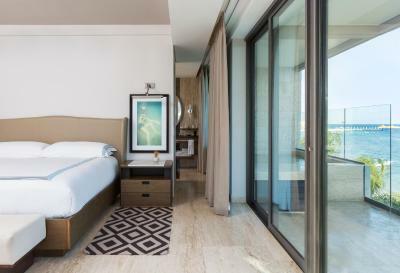 Thompson Playa del Carmen has been welcoming Booking.com guests since 5 Jun 2015. 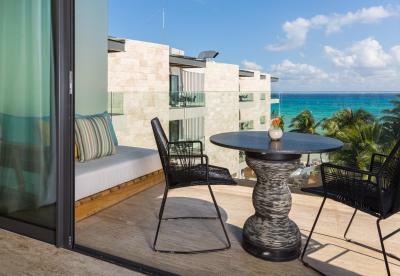 When would you like to stay at Thompson Playa del Carmen? 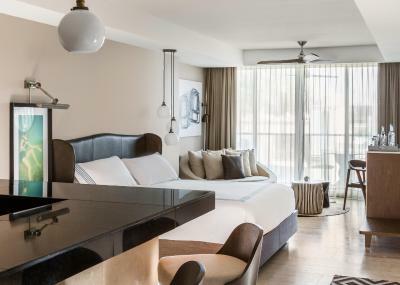 City view room with mid-century contemporary décor features a cocktail bar, rain shower, king bed with sateen-woven linens and complimentary Wi-Fi, air conditioning and flat-screen cable TV. Public parking is possible at a location nearby (reservation is not needed) and costs USD 20 per day. Third floor suite with private living area and city views, mid-century contemporary décor features a cocktail bar, rain shower, king bed with sateen-woven linens and complimentary Wi-Fi, air conditioning and flat-screen cable TV. Second floor room with private terrace and daybed overlooking 5ta Avenida, mid-century contemporary décor features a cocktail bar, rain shower, king bed with sateen-woven linens and complimentary Wi-Fi, air conditioning and flat-screen cable TV. 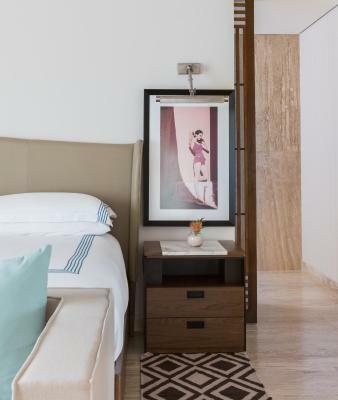 Room with private terrace and daybed overlooking 5ta Avenida, mid-century contemporary décor features a cocktail bar, rain shower, king bed with sateen-woven linens and complimentary Wi-Fi, air conditioning and flat-screen cable TV. Second floor room with private terrace and daybed overlooking 5ta Avenida, mid-century contemporary décor features a cocktail bar, rain shower, two queen beds with sateen-woven linens and complimentary Wi-Fi, air conditioning and flat-screen cable TV. 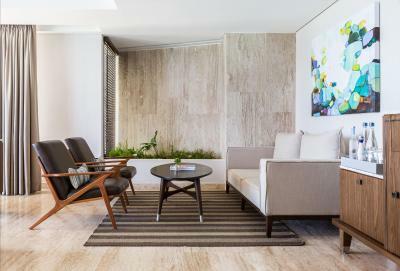 Corner suite with private living area, private terrace with daybed and partial sea view, mid-century contemporary décor features a cocktail bar, rain shower, king bed with sateen-woven linens and complimentary Wi-Fi, air conditioning and flat-screen cable TV. 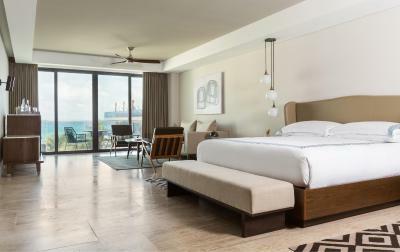 Large corner suite with private living area, private terrace with daybed , 5ta Avenida and partial sea views, mid-century contemporary décor features a cocktail bar, rain shower, king bed with sateen-woven linens and complimentary Wi-Fi, air conditioning and flat-screen cable TV. This double room has a minibar, seating area and soundproofing. 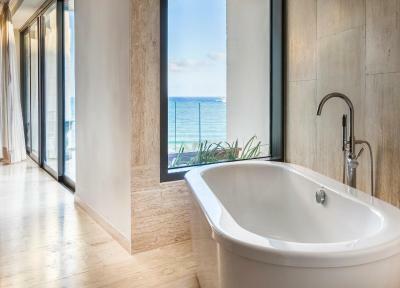 House rules Thompson Playa del Carmen takes special requests - add in the next step! 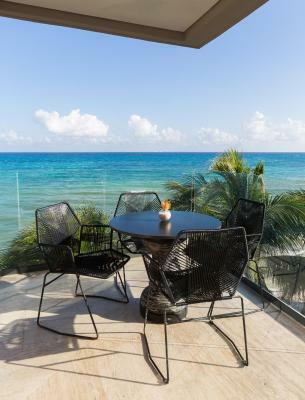 Thompson Playa del Carmen accepts these cards and reserves the right to temporarily hold an amount prior to arrival. A service charge of 10.00% is not included and must be paid at check in. *Yoga: Rooftop Yoga each morning at 7 hrs. Vinyasa Yoga Monday through Thursday, and Sun Power Yoga from Friday through Sunday. *Tequila or Mezcal tasting: This will take place at the Beach House Pool Bar at 18 hrs, featuring different types of Tequila Herradura (Reposado, Añejo, Blanco, Ultra). *WiFi: Current speed of the complimentary connection is 3MB. *Daily bottled water: Every guest will have 2 bottles of Thompson Water at the turndown. *Turndown: Chef prepares 4 different types of Mexican candies (alegria de pepita, alegria de amaranto, cocada & traditional chocolate chip cookie). 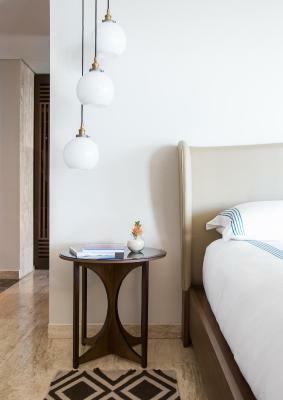 Please inform Thompson Playa del Carmen in advance of your expected arrival time. You can use the Special Requests box when booking, or contact the property directly with the contact details provided in your confirmation. Thermostat in room wasn’t operating - had to get engineering to fix by 2 nd stay. Tequila tasting was extremely disappointing - we have come to the Thompson for the past 4 years and the tequila tasting included more than adequate amount of tequila to the point that the bartender was able to make 2 full cocktails from what was left over. This year however the amount given was approx 1 tablespoon worth. Everything was excellent, from the front staff, Ricardo who went above and beyond and Julian who made sure our trip was flawless. If you want to relax by the pool, stay somewhere else. The house music they play is OBNOXIOUSLY loud, you can't hear yourself think. Also, $8USD for a bottle of water is completely and utterly taking the p!$$ - use the free water in the rooms. Bedrooms can be loud, from either music from the bars outside, garbage trucks overnight, or drunk people yelling. No in-room coffee making facilities. Overall, overpriced. Communication, everyday at the pool restaurant they would get our order wrong or forget an item. Location , View , Food , Pool at the roof top . The concierge emailed us weeks in advance of our arrival and then disappeared, suggestions on what to do were very limited, I am not sure whether that's due to the competence of the concierge or to what the area has to offer. The rest of the staff was wonderful. Fantastic room quality and very central location, the staff was wonderful, nice view from the pool and nice setup at the beach house. Nice. Doesn’t worth the money. The bar and restaurant is too expensive. It was nice and clean but that’s it. The design, the service of the staff and the cleaning of it. Very noisy hotel. Front desk staff at check in was not welcoming. Pool closes very early. Very clean and great location. Housekeeping staff and checking out front desk staff was really nice. We had to move from the 5th avenue location to the Beach House due to constant drilling. We were woken up at 8.30am and it would not stop. While the staff were more than apologetic and accomodating, I feel that they should have warned us before we checked in as I am sure they would be aware of these works occuring (the building works began Monday morning and we checked in Saturday).